Paying attention is something that I’m not naturally good at, skillful at, or even desire to do all the time. It’s easy for me to check out, to become lost in my thoughts, to disconnect. To disconnect from the present, to disconnect from my wife and children, to disconnect from a meeting, and disconnect from the Lord. What I have found in my own life is that when I am not paying attention, I miss out. So my word for 2018 has been: Be present and pay attention. I believe that if we want to experience revival in our lives, churches, and our city, we must be present, we must pay attention. The disciples in this story have already been a part of the feeding of the 5,000 and the 4,000 and have found themselves bickering over not having enough bread for each other in the boat with Jesus. Oh, how I relate to these disciples. How easily I forget what Jesus has done in me and through me. Over hearing their argument, Jesus tells them to beware of the leaven of the Pharisees who continuously demand miracle after miracle and choosing not to believe. Jesus rebukes his disciples and sternly asks them, “Don’t you understand? Are your hearts hard? Do your eyes work? How about your ears? Do you not remember? Are you paying attention?” He then reminds them of the miraculous and wonderful provision He provided the crowds and how they had plenty left over. My invitation for you is to join me in paying attention. Paying attention to the Lord and being present with others. Loving the Lord and others enough to listen to their words, to watch what they are doing, to experience life with them. Revival will happen when we are present because we get to see what is happening, to share common experiences, and when we pay attention it is possible for us to remember the great things the Lord has done which we can cling on to by faith. Lord, we confess to you that we have not been as present as we could have been with you and with others. Assure us that when we are tempted to check out that we remember that it is worth it to keep our eyes and ears open. Help us to love others enough to be present in conversations and experiences. For when we are present our emotions are in line with our experiences. Help us not to miss out on what you are doing so that we may join you in this exciting mission you have for us. Thank you for paying attention to us even when we are disconnected from you. Today I had an image come to mind as I was listening to the Love and War Worship podcast Episode #3: The Worship Leader Persona. It was an image of two worship leaders side-by-side. One had his guitar in the front of him ready to play and the other with his guitar slung behind his back. If you’re a guitarist, you might be thinking that he better have strap locks on that expensive Taylor (or *cough* Martin – can you tell I’m a Taylor guy?). Anyhow, this image struck me in a meaningful way and got me thinking about the identity of the modern worship leader, which includes the themes of both calling and vocation. Early in my ministry in the mid-2000’s I had these 3 things (identity, calling, and vocation) intertwined, where my identity was defined by my calling and vocation. To me at this time, my identity and worth were wrapped up in what I brought to the table… my musical skill, my creative ideas for worship, the delivery on Sundays, etc, etc. So if I had an “off” Sunday, I could easily question my position aka vocation. After listening to Jon and Jack of Love and War Worship discuss the persona of the modern worship leader, I was reminded of the life of Jesus. This is where the calling comes in… as sons and daughters of God our calling is to be formed into the likeness of Jesus through the work of the Holy Spirit, to represent the Father to the world with all the authority of heaven and earth, to build spiritual family, and to make disciples [no matter our vocation]. Notice I didn’t list worship leader in this description of our calling. This is where the 2 images of the worship leaders with guitars comes in. Both have guitars, but 1 is in front and 1 is behind his back. The 1 with his guitar in front placed his vocation of worship leader as his identity and calling. The 1 with his guitar slung around his back considered his vocation of worship leader as a tool to enhance his calling as disciple-maker and flow from his identity as child of God. I believe that the persona of the modern worship leader is the image of the worship leader with his guitar in front living from an identity where vocation and calling are contained on the Sunday-morning-stage. What would it look like to embrace disciple-maker as your calling before your vocation as a worship leader? Looking at Jesus’ life in the book of Luke, where do you see discrepancies between your ministry and His? How might He be inviting you to spend your time differently? What would it look like to utilize your gift of music and passion for worship off the stage beyond the Sunday-morning experience? Always ready with guitar slung around the back, but hands free to be about our Father’s business of making disciples and building spiritual family. Worship, meet Mission. Mission, meet Worship. So last night, 7 of us from Oikos Church rode the Metro Rail south in the Near Northside from Moody Park. As we pulled up to the Fulton stop, a homeless gentleman got on board with a $5 Little Caesars pizza. With guitars in hand, we struck up a conversation, his name was Cowboy. I asked him about his thoughts with regards to the tension between the Northside and the Salvation Army. He spoke about how unfortunate it is that so many of the men at the shelter are working hard to succeed and then everyone wants you to leave the neighborhood because of “one bad apple.” As we pulled up to the Quitman platform, we got off, and he invited us to come into the Salvation Army facility to sing and pray with the men. This was a twist that I didn’t plan on… I was simply planning on worshiping and praying out front, but God put Cowboy in our path to direct our steps deeper into the heart of where we were going. When we got to the side gate, out popped a security guard, who asked what we were there to do. So I explained that we just wanted to come worship and pray over the neighborhood and the Salvation Army and that Cowboy had requested we come inside instead. He then said he had to check with his supervisor, who then came out and asked the same question. He then gave us the okay to come in. As we walked in, there were probably around 100 men, mostly veterans, sitting around this outdoor pavilion in a big square. We greeted a few as we walked in and were welcomed with smiles. We made our way to the center of the pavilion when all of a sudden a couple guys told us we’d better move. Sure enough, there were pigeons roosted above our head and they didn’t want us to get pooped on. However, Adrian’s homemade drum set didn’t make it without casualty. [Sidebar: Adrian made this sweet drum set out of plywood and tupperware that included a hole for his splash cymbal… no joke]. Then these two gentlemen thanked us for being there because we were needed. They gave us their blessing and encouragement. So we sang “Good Good Father” by Housefires there amidst all the men. The volume of conversation came down. We got to declare who our Heavenly Father is to all the men, that’s He is a good father who is perfect in all of His ways to us and how we as His children are dearly loved by Him. Our time in the pavilion was cut short since the men had trouble hearing their names being called over the music, so then I gave a blessing over the men that God would draw them close to His heart, that His kingdom would reign in this place, that these men would be blessed with health and prosperity, for safety, for transformation, for faith, hope, love and peace. Ready for another twist? Another gentleman came up to us and recommended that we come back regularly because they currently do not have anyone leading music for their chapel service. What?! We not only received an invitation into the Salvation Army shelter, but got invited to come back. And as we walked out the gates, the security guard who let us in said, “Do you remember me? I met you on the Metro stop last month when you sat on the platform and worshiped with your two friends.” I shouldn’t be surprised at these people the Lord leads me to, but was simply encouraging that nothing we do nor place we go is ever wasted by the Lord. The night was still young, so us 7 and a couple gentlemen continued with more worship and prayer out front for 30-45 minutes. We prayed for the homeless, we prayed for the Northside residents, we prayed that there would be reconciliation between the neighborhood and Harbor Light (Salvation Army), we declared God’s victory over the evil that has occurred, heaven touched earth on North Main last night. The Holy Spirit will often just give us a glimpse of the mission when he speaks to us, and only when we step out in obedience, even with all the ambiguity that can come with it, do we get to see how the mission is unfolding. Jesus’ Person of Peace strategy works. In Luke 10, Jesus chooses 72 disciples to go out into towns to search for the persons of peace. He asked them to greet them with peace and if your peace rests upon the household, then stay there. If your greeting of peace is not accepted, then shake the dust from your feet and move on. Harbor Light was a house of peace for us last night. And if this is the case, transformation in Christ is inevitable. I’ve been praying often for how my Homebrewed spiritual family (missional community) can dig our heels into the Near Northside, and hasn’t been until last night that that was revealed. For me, this reaffirms reflection #1, we need to step out and engage the community we are in in order to find our house of peace. My prayer for my neighbors is that we embrace our victory in Jesus. In Him we can be strong and courageous without fear, darkness cannot exist when the light shines, and as God’s sons and daughters we get to proclaim the Good News of Jesus that in His kingdom all wrongs are made right. The catch? In order to see the kingdom of God we may have to take a risk and love our homeless neighbors enough to go say hello and introduce ourselves. And if you’re feeling really risky, maybe even invite them into your life… and your home. If you’re interested in joining my homebrewed spiritual family at Harbor Light, hit me up at jason@theoikos.org. It looks as if we may be having a predictable rhythm of worship and prayer in the near future pending a couple conversations. Ashley and I have had the unique privilege of journeying with a dozen or so other worship leaders in the Love & War Learning Community led by Jon Shirley and the Gathering Network in Kansas City, Missouri. It has been a wild and fun (and hard) ride where we have been stretched in our understanding of what it means to be worship leaders; more importantly incarnational worship leaders. We’ve tackled practices like hearing God’s voice and the role of prophecy, incarnation over presentation, and most recently during our last trip to KC we tackled the practice of intercessory worship, what Jon calls Worship as War. So during our time in KC, we all split up into groups of 4 and set out into the ‘hood with our guitars and our orange Home Depot 5 gallon buckets. What? We’re doing what? Our task was to move out into the neighborhood, pray that the Lord would show us where to go, and when we decided where to sit, we would pray, listen, and then worship over that section of the city. We would then take what we heard the Holy Spirit saying and then write a song for that specific moment in time for that specific place. We were going to war for the kingdom of God against the enemy. It was a good stretch, but how were we to incorporate this into our rhythm of life back home in Houston? Well, it took a couple of months being back home before I heard the Lord speak. In my discipleship huddle, I invited my guys to join me on a prophetic prayer walk one week day. My friend Victor and I parked at Moody Park, prayed that the Lord would speak to us, that He would show us who we were to speak to that day as we walked. Neither of us came away with a clear word from the Lord, but we walked to the platform, got on the train and headed to the Quitman stop on the Red Line at North Main. We sat, we prayed, we talked, we listened. 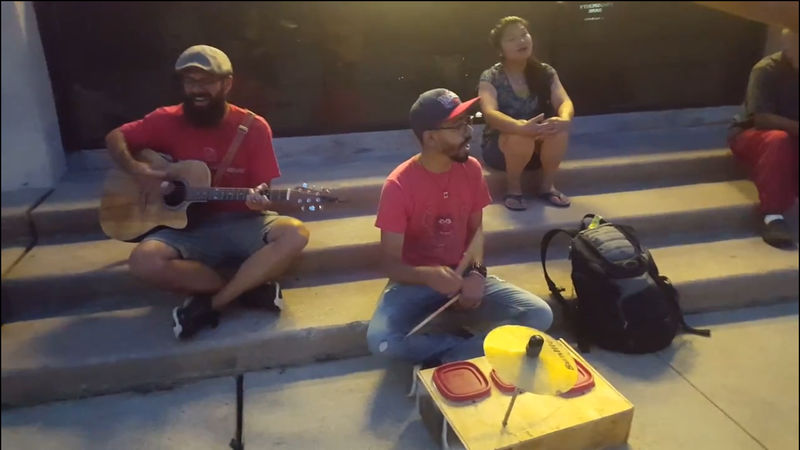 I made a comment that, “Man… Houston needs more street musicians. This would be an awesome spot for some music.” Then bam… it hit me. The Lord spoke. “I am a musician,” I thought. I shared it with Victor and then remember our worship adventure in Kansas City. Perhaps this is how the Lord wants me to go to war for my neighborhood. To bless those in my part of the city with some music and to go to war for them… through worship, music, and prayer. 13 As all the men of Judah stood before the Lord with their little ones, wives, and children, 14 the Spirit of the Lord came upon one of the men standing there. His name was Jahaziel son of Zechariah, son of Benaiah, son of Jeiel, son of Mattaniah, a Levite who was a descendant of Asaph. 18 Then King Jehoshaphat bowed low with his face to the ground. And all the people of Judah and Jerusalem did the same, worshiping the Lord. 19 Then the Levites from the clans of Kohath and Korah stood to praise the Lord, the God of Israel, with a very loud shout. 22 At the very moment they began to sing and give praise, the Lord caused the armies of Ammon, Moab, and Mount Seir to start fighting among themselves.23 The armies of Moab and Ammon turned against their allies from Mount Seir and killed every one of them. After they had destroyed the army of Seir, they began attacking each other. 24 So when the army of Judah arrived at the lookout point in the wilderness, all they saw were dead bodies lying on the ground as far as they could see. Not a single one of the enemy had escaped. Worship as War. The battle belonged to the Lord. So the singers (Worship Leaders) were placed on the front. They sang and then we read that the enemy became confused and started fighting each other! Get out! So this past week on June 23rd around 11am, I took our two Oikos Church interns, Wynn and Rachel (also musicians), with me to the METRO Rail. We parked at Moody Park, rode the rail to Quitman @ North Main with two guitars and a viola. With a bit of fear and hesitation we sat down and started playing “Great Are You Lord” by All Sons and Daughters. There were a few people around us, but not too many. As the sun beat down, we sang and played our hearts out as my heart broke for my neighborhood. Houston’s Near Northside has undergone a recent tragedy with the heinous murder of 11-year-old Josue Flores; it’s brought about both fear and solidarity within my neighborhood. I heard the Lord saying he will pour out His peace on this place. So we simply vamped on the instrumental and I tried my best to sing the prayer over the song (this is an art and skill that would do me good to practice!). But I did it: “God, pour out Your peace, release Your peace, here in this place.” Did it work? We’ll get to that. So we moved on to another song and as we made it to the middle of verse two of “My Lighthouse” by Rend Collective, the METRO Rail Train rolls up and who steps out but a Houston Police Officer. As soon as she stepped off the train, she walked right up to us and said, “What are you guys doing?” Her tone didn’t carry the melody of genuine curiosity… it was more contemptuous and caustic. So I said we were worshiping over the Near Northside and praying for peace. She then told us that we could only be there if we purchased a METRO ticket and asked if we had them. So one by one, she asked each of us to pull out our tickets. We were good until 2:30pm. Phew! Glad we actually purchased our tickets. Before she walked way, she muttered that what we were doing was weird. Well… yeah, I thought so, too in a way! So we continued with our song. As lunchtime approached and having about 30 minutes of worshiping under our belt, the engagement with others started to happen. 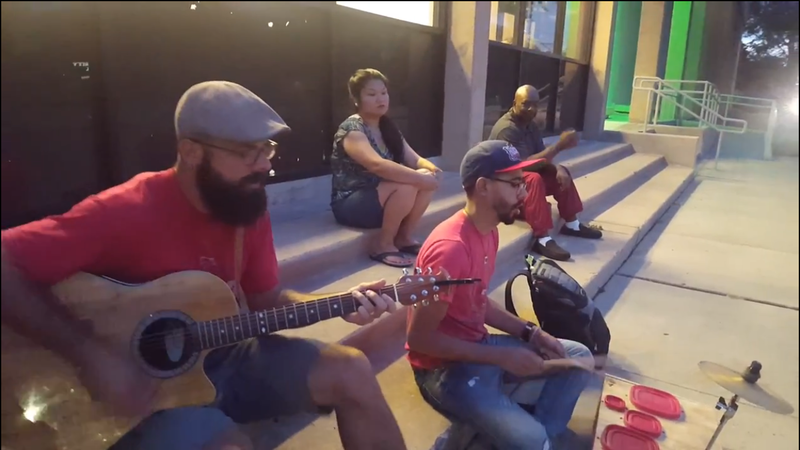 We had a guy who was previously homeless, but now a pastor and college student worship with us and film us as we sang “Good Good Father” by Housefires. That got the attention of others, so more came near. We then decided to wrap up. So we stood up and invited the others on the platform to huddle up and pray with us. I kid you not… every man on that platform joined us in prayer. There were probably 10 of us. And the last guy to join us ran from the other end of the platform to make sure he didn’t miss this opportunity. So there we were… mostly strangers, with arms around one another, praying for peace in the Near Northside, that God’s kingdom would breakthrough, that people would be freed from addictions, that crime would stop, that God’s love would be known and felt. We said amen and then the thanksgivings were abundant. One man thanked us several times, because he stated that this immediate has been a very dark place for a long time and that his day was now better because of this. His day was better. The joy of the Lord captured the hearts and minds of those around us. Even the officer left with a half-smile (no… she didn’t stick around to pray, but maybe next time!). So we got back on the train and headed back to Moody Park. Well… we weren’t done yet. We had the opportunity to sing and worship on the train with some other passengers who were intrigued with our instruments. These two young men said that wanted to be soothed… and soothed they were. They said that song would be stuck in their head all day. Music and worship soothes the soul and is a way of bringing beauty into ugliness, love into hate, light into darkness, and bringing the dead back to life. We went to war for these people and I’m confident that many battles were won that day. The battle belongs to the Lord. And yes, much like the battle of King Jehoshaphat, there was some confusion. But mostly hope. And no one died, which was good. Worship Leaders, what is the Lord saying to you? How is he inviting you to go to war for Him? What does it look like for you to worship over your city? To intercede on behalf of others? To fight spiritual battles via worship? To make life more beautiful? Me? Well, this is going to be a weekly practice for me, a predictable pattern. This will be something I will be doing with my new worship leader intern Ian when he begins this July. I also hope this pattern will be an opportunity for a movement to begin to grow within our city of Houston, and I hope to invite other worship leaders in this fine Bayou City to join us. I believe this practice of Worship as War will be a catalyst for a movement of incarnational worship leaders who can begin to live on mission when off the Sunday stage. I hope this gets you excited. It sure breathes life into my ministry. It’s nothing short of an adventure. Would love to hear from you. This morning at our daily devotions at Target Central Starbucks, we were discussing hearing the voice of the Lord even during times when He seems silent. We know that the Lord delights to speak to us, spend time with us, and hear from us. However, we also have seasons where either the Lord is withholding His voice, or perhaps the silence is created by all the distractions and cloudiness within our own mind. Either way, God’s character never changes and even in the silence we know that God is near. In verses 1-10, Asaph is lamenting because God has seemed to have “turned his hand” against him. A time of silence. A time of painful stillness. A time of trouble. However, in verse 11, Asaph’s faith kicks in. When we can’t hear the voice of the Lord, we then can rely on what we know the Father’s character to be. God is a good father. When we can’t hear him speaking, we still know who he is. When he seems far, we know He is close. When we don’t know what to do, we still have the example of Jesus. It’s similar with God. We know His character, so even when we can’t hear His voice specifically, we still have a pretty good idea of what Jesus would do. We know who we are, too. We are His kids. And because we are His kids, we represent Him wherever we go. So let’s do what we know He would do. So today, as I drove home from devotions I didn’t necessarily have a plan for how I would exactly spend my time. So I prayed: “Lord, what is your plan for me today? How should I spend my time? Who should I talk to to? Where should I go?” I had sort of planned to go to our church campus and get some planning done, work on the website, write a song, and other office-type work, but I decided to go home first last minute. As I pulled onto my street, there were my neighbors shoveling two cubic yards of limestone and sand for the pavers they were going to install for their new backyard patio. Alright, here we go. So I got to spend an hour or so shoveling rock with my neighbors. And it was good. I’m thankful I had the opportunity I did. I didn’t hear the Lord tell me to help my neighbor. But I knew that Jesus would have if He were me earlier today. So take the time in all your comings and goings to consider what Jesus would do if he were you. And I even had time to finish all the other work I wanted to do (including this blog post), and I feel more energized. Missional worship leaders are good neighbors. Good neighbors bear good fruit. Good fruit produces more good fruit. How can you be a good neighbor this week? One of the common comparisons we often hear about and talk about in the life of the church is whether or not we are an attractional or missional church. The point of this post isn’t to pin us up against one another, but to pose a question that I think is worth asking when we hear the word attractional. Typically when we think attractional church, we identify churches who use Sunday worship as the front-door of evangelism. The design/programming/environment of the Sunday experience is attractive in order to attract people to come and to stay. Worship gatherings, programs, and events are marketed to a particular group of people to “come and see”. Most events/gatherings are happening at the church building, the temple. And they are executed with excellence and precision, because it’s intent is to be attractive. When we think of the missional church, we might think of churches who aren’t as Sunday/Program/Building-Centric and are builders of a more organic culture through the creation of spiritual families. Missional Communities (aka Spiritual Families on Mission) provide incarnational ministry in all arenas of life; where people work, play, eat, and rest. The people are discipled and empowered to carry out the authority of Jesus as sons and daughters of God in order to extend God’s kingdom. Worship and meals are often happening in homes in order to invite people into spiritual family. And it’s worth saying that much like the attractional church, worship gatherings on Sundays may also be done with excellence and precision; it just may not be as heavily emphasized. It’s more about culture, metrics, language, and purpose that characterize the two. I want to pose a few questions: What if we broadened the spectrum of the attraction? What if we used the word attractional and applied it to the overall life of the Church? Applied it to the life that we live? This is where missional and attractional intersect. Actually, I want to pose that Missional IS Attractional. In order to understand missional as attractional we must change our spiritual glasses with new lenses. We must step back and see this from a kingdom-perspective. Simply stated, the kingdom of God is the most attractive thing in the world. In His kingdom, people are made whole, they are united with their creator, savior, and sustainer, there is unconditional love, forgiveness, there is family (I often say that water is thicker than blood), there are families united together in covenant with one another through Jesus, there is no sickness nor sin, no loneliness, and we are in the presence of God. Even though all of life won’t be perfectly restored until Jesus comes back, these are the glimpses of heaven we get to invite others into and what a beautiful and yes, attractional, life this is. When people encounter you and your spiritual family, when they encounter the kingdom throughout the week, they have already experienced so much more than the attraction of a Sunday morning service. When people experience Jesus and are living within a spiritual family on mission, all the lights, smoke, bells, whistles, Aeolian Wind Harps, giant LED screens, and confetti just don’t mean as much. May the power of God breakthrough into the lives of those around us as we take risks for His kingdom. May the life we live as homesteading worship leaders draw people in to the family of God because it is oh, so good. May the spirit speak to us on how to fulfill our calling as worship leaders in our everyday lives so that we may be good builders of spiritual family and mature disciples who make disciples who make disciples. I have always hated being vulnerable. Vulnerability to me always meant weakness, and a big opportunity for someone to leave me with an emotional scar. The kind of vulnerability that Jesus wants me to have is not the same definition that I have always envisioned.